I have been wanting to make a touch screen mirror for a while now. So today I bought an aspire z3101 all in one computer to get started (because it was cheap). I’ve been looking online for ages to see which type of touch screen it has, can anyone shed some light on this for me? MMM-Console - On screen console output. I created this module to give more of a "nerdy" feel to my mirror. Displaying the developers console log directly to the mirror. For the moment it's quite basic. The current config only allows you to change the number of lines displayed and the color for each function. Installation is very simple, just clone the git into your modules directory then add the module to your config. @sdetweil I like the sound of that! But yeah the crash part may be an issue. But in some cases the module’s just stop updating and your mirror holds the same web content? In case anyone is interested, I have managed to get the console output from anytime after the console module is loaded. 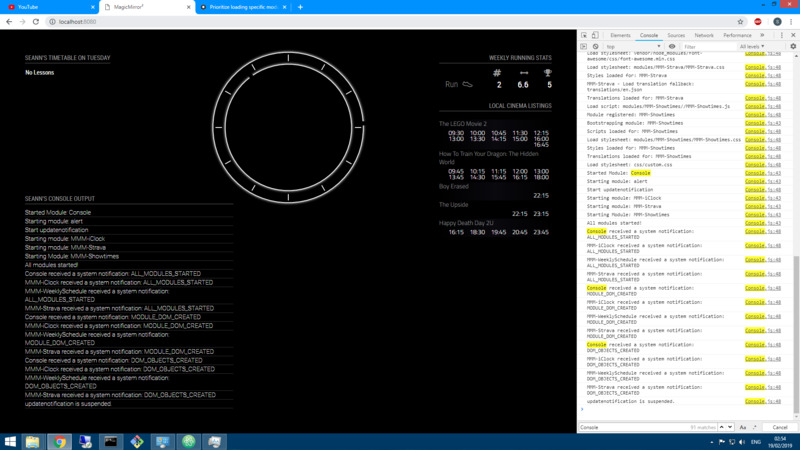 I had an idea of outputting the developer console to the mirror window to give it more of a nerdy feel. I have managed to get it to output to the html but I would like it to log all console output even those which say loading modules ect, does anyone have any idea how I could go about achieving this as a module? I should have been a little more specific, I have made an override for the Log.info function currently. It display’s to html any output after all the modules are loaded and the updatenotification is suspended. @kazanjig If you edit the module “MMM-Unsplash” then yes. It’s a lot easier than it sounds honestly. RE: Uncaught TypeError: this.sendNotification is not a function at HTMLParagraphElement. then inside the start function assign it’s value to be the module.